Bath is known the world over for its elegant Georgian architecture, majestic Roman Baths and literary icon Jane Austen. But look behind the grandeur and beauty and you'll find the city's rich food and drink culture, as Katie Smith finds out. The food and drink scene in the South West is thriving – and the city of Bath is no exception. More widely known for its depiction in many of Jane Austen’s much-loved novels and status as a UNESCO World Heritage site, it was also the epicentre of a food revolution in the UK with the establishment of the country’s first farmers’ market in 1987. Several decades on and the market remains true to its roots, showcasing the West Country’s freshest and tastiest regional produce. Indeed, Bath has proffered its name to many of the area’s local delicacies and producers: the Bath bun, Bath Blue cheese, Bath Olivers, Bath Chaps, Bath Gin and Bath Ales, to name but a few. This pioneering foodie spirit runs throughout the city – in its independent cafés, restaurants, pubs, delis, grocery stores and speciality drinks shops – and culminates every year in the Great Bath Feast when Queens Square is transformed into the centrepiece of the food festival for the entirety of October. There are Michelin-starred restaurants, fantastic local produce, flourishing culinary talents and world-class food festivals all within walking distance of each other. 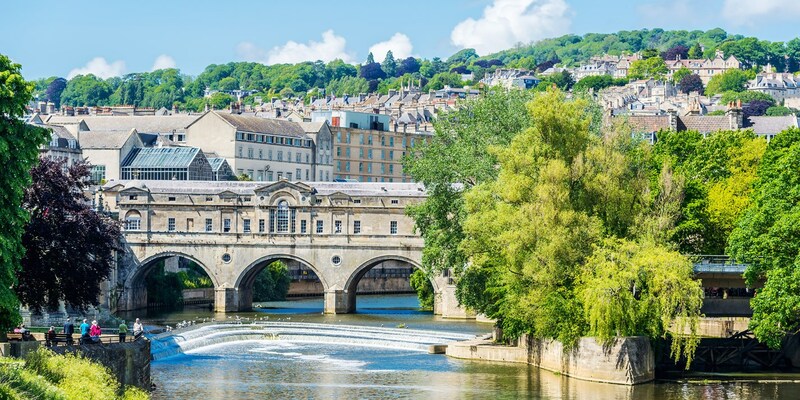 Bath is most certainly not shying away from making a big impact on the UK’s food and drink landscape – read on for some more of the best places to eat, drink and shop in one of the South West’s most historic and scenic cities. Yammo! – hands down the best Neapolitan cuisine outside of Italy! It’s a bold statement, but when you see the skill and passion that goes into making each and every single dish you won’t disagree. The same can be said for the ingredients. Every plate of pizza, antipasti or misto fritto is hand-crafted with either local ingredients or those sourced directly from Italy: fresh ricotta from Westcombe Dairy, green Sicilian Nocellara olives and San Marzano tomatoes ripened on the sun-soaked hills of southern Italy – all served with welcoming Neapolitan hospitality. 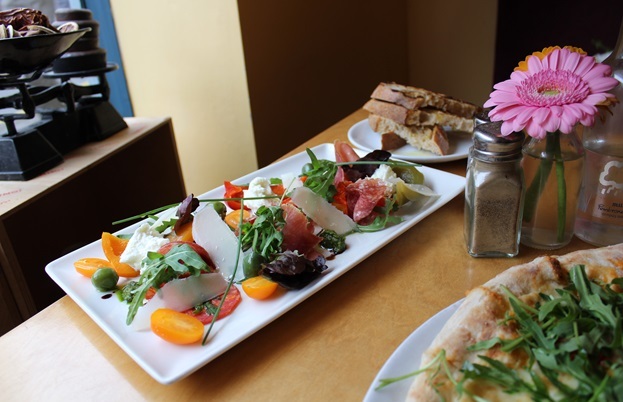 Sam’s Kitchen – a popular Bathonian lunch hotspot serving an enticing array of small plates, salads and cakes. Locals stop by on their way to work for a quick coffee at the street-side hatch and return in the evenings in search of tapas dishes brimming with quality British ingredients. Everything on the menu is made from scratch on the premises and comes fresh and direct from a select range of small-scale producers. This eatery is a true embodiment of the nose-to-tail ethos – nothing goes to waste and every tasty morsel is celebrated. Same Same But Different – a relaxed, bohemian vibe permeates the air of this café-come-bistro-come-restaurant. In the morning delve into the incredible breakfast menu with a cup of Fairtrade organic coffee or enjoy a sumptuous sandwich made with Bertinet Bakery bread at lunchtime alongside a freshly baked slice of cake. Added to this is the tempting pan-European tapas menu that will certainly give you cause for hunger-induced indecision. Beyond The Kale – you’re sure to feel healthier and energised after just one visit to this Green Park Station eatery specialising in vegetarian, vegan and predominantly organic food. Stepping through the door your eyes can’t help but be drawn to the colourful array of creative salad dishes and deli items displayed proudly on the counter. If you are after refreshment, revitalise both your body and mind with a freshly blended juice. Yak Yeti Yak – everyone in Bath loves Yak Yeti Yak – and this is coming from a Bathonian so it must be true! A world away from the bustling streets is this little taste of Nepal with traditional low tables and floor cushions. The food is fragrant and delicately spiced, with just as much emphasis placed on the vegetarian and vegan dishes as those cooked with meat. Round the meal off in true Nepalese style with a Gurkha beer. Menu Gordon Jones – Michelin-trained head chef and owner Gordon Jones is renowned for his highly individualistic surprise menus – so-called because the selection of beautiful dishes featured on each service are designed completely around the ingredients available from the restaurant’s local suppliers that very day. Allium Restaurant – fine dining at accessible and affordable prices. Chef Chris Staines has brought Michelin-starred quality to his menu encompassing international flavours and ingredients. The al fresco dining area is an ideal spot for soaking up the sun with a drink in hand and a small selection of tantalising small (and large) plates. The Bath Priory – this Michelin-starred restaurant occupies an enviable position overlooking beautiful gardens within The Bath Priory luxury hotel. Executive chef Sam Moody’s passion for fresh, high quality produce directs the modern European cuisine on the menus for which the restaurant has become famed. The Chequers – legendary Sunday roasts, traditional pub classics and innovative seasonal dishes created using the freshest produce from the South West. If after all of that you have room for more then indulge your sweet tooth with one of the expertly crafted desserts and matching wines or go all out and opt for the seven-course tasting menu with optional wine flight. Sotto Sotto – venture down below the Georgian buildings dotted along North Parade and you will find a softly lit vaulted cellar filled with the delicious smells of contemporary Italian cuisine. Renowned locally for its use of superb Italian ingredients and fresh, regional produce, it is advisable to book ahead to guarantee a table at this local hotspot. 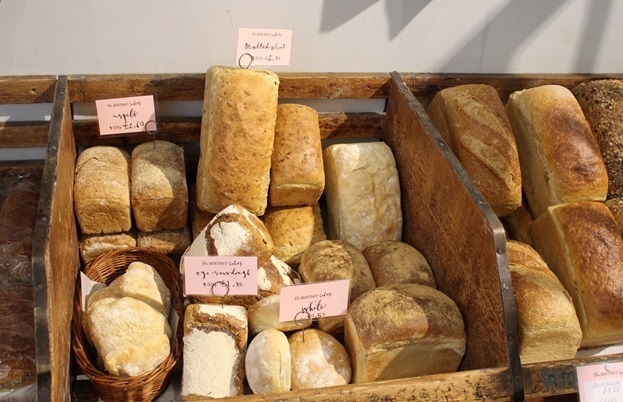 The Bertinet Bakery – a place of pure pâtisserie perfection, not to mention beautiful breads and viennoiserie. Breton Richard Bertinet’s knowledge of traditional baking techniques and recipes is evident from the bakery’s trademark sourdough loaf right down to its signature almond croissant. My personal favourite is the almond pain au chocolat for its unashamed indulgence factor! 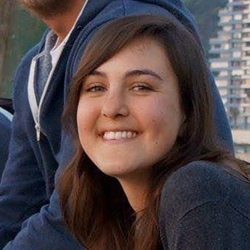 The Thoughtful Bread Company – an eco-artisan bakery dedicated to creating wholesome loaves of real bread using traditional, slow fermentation techniques with recipes free from artificial preservatives. 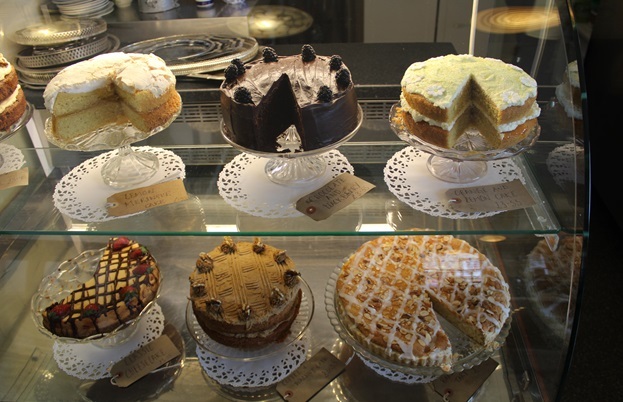 The shop’s opulent sandwiches and toasties are an ideal antidote for lunchtime hunger pangs, but it’s not all about bread as each day brings a fresh range of delicious homemade quiches and cakes. 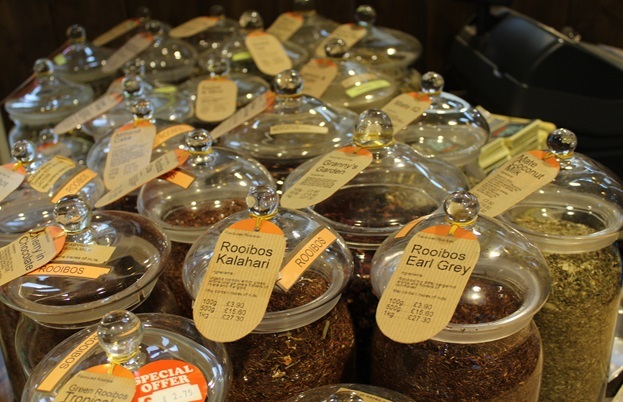 Teahouse Emporium – this tea shop is a true embodiment of its name, packed to the rafters with an endless choice of tea spanning the spectrum across black, white, green, herbal and fruit varieties, all the way through to yerba mate and even coffee. You can also pick up all the teapots and tea accessories you’ll ever require, including Argentine mate cups! 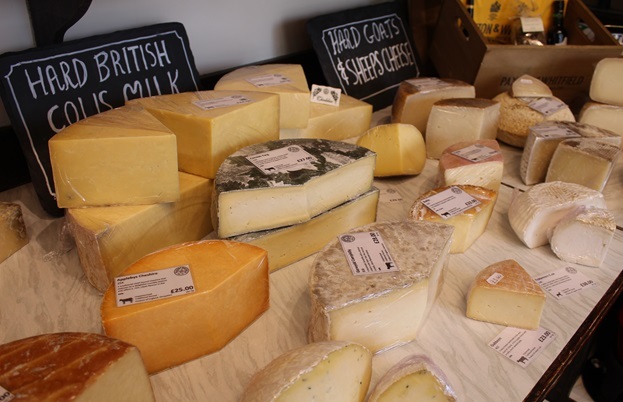 The Fine Cheese Co. – situated in the city’s Artisan Quarter, this specialist cheese shop is where you’ll find artisan cheese in glorious abundance. Browse the range of British and continental cheeses ranging from hard, soft, blue, washed-rind and aromatic and stumble across a hidden gem crafted by a master cheesemaker. Try the local specialities Bath Soft Cheese, Caerphilly, Rachel and Tor. 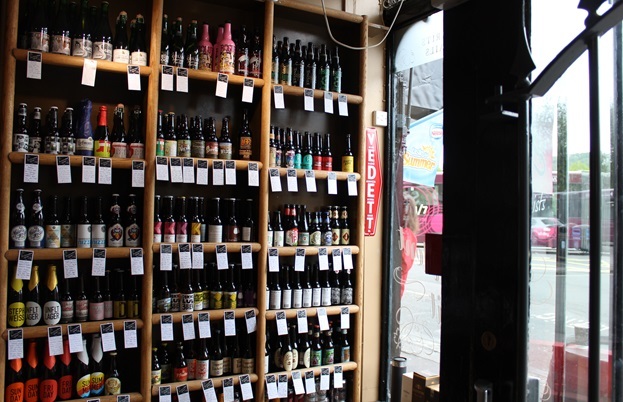 Independent Spirit of Bath – owners Chris Scullion and Christian Morrish share their experience and passion for craft beer (and many other specialist tipples) with customers in the heart of Bath. Their combined knowledge has evolved to create a unique and exciting blend of world and local beers, whiskies, rums, gins and other high quality spirits. The purveyors also guide customers through tastings and masterclass events in the Georgian vaults below the store. Colonna & Small’s – discover speciality coffees hand-picked for their unique flavour profiles and character. The menu of espresso and filter coffees changes week on week, reflecting the changing seasons of the countries from which the coffees are sourced. The baristas here really know their coffee and can guide you through the menu to help create your perfect cup. Tasting Room – the bottles adorning the walls of this wine and spirit merchant come courtesy of the Old World direct from the winemakers themselves and are nestled beside an ever-growing array of spirits and whiskies. Gin is most certainly on the menu too, with tasting events accompanying regular whisky and wine evenings. 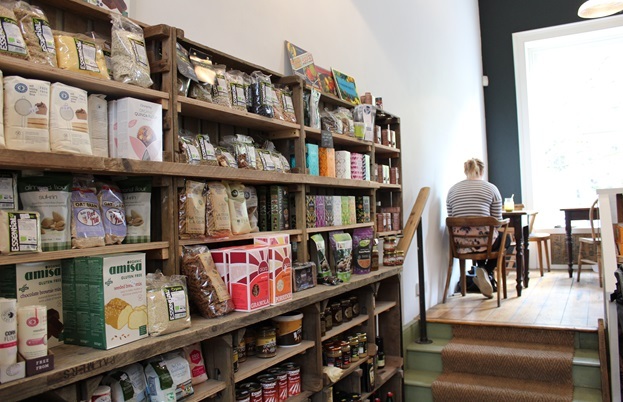 At lunchtime the store has a distinctly Mediterranean feel and serves seasonal tapas to complement a glass of wine (or two). As darkness falls the transformation into intimate wine bar is complete. What’s more, you can take your favourite bottle home with you! Canary Gin Bar – gin, gin and more gin. This gin palace created by the company behind Bath Gin specialises in all things gin-related. Jane Austen is a recurring theme here, not only making an appearance on the bar’s signature bottle but on the cocktail menu too, with creations such as ‘The Darcy’ and ‘Wickham Mule’. 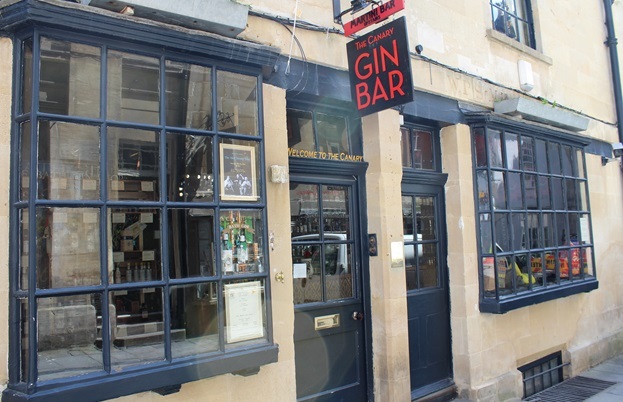 Plans are also underway below ground to set up the first gin distillery in Bath for 250 years. 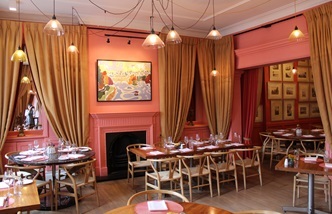 Vino Vino – a fine wine and cocktail bar situated around the corner from the Theatre Royal. Good food and drink is the order of the day here, with the wine list boasting over 200 varieties spanning both the New and Old World. A continental atmosphere pervades with a selection of small plates of artisanal produce designed to match perfectly with the distinctive characteristics of the wines. 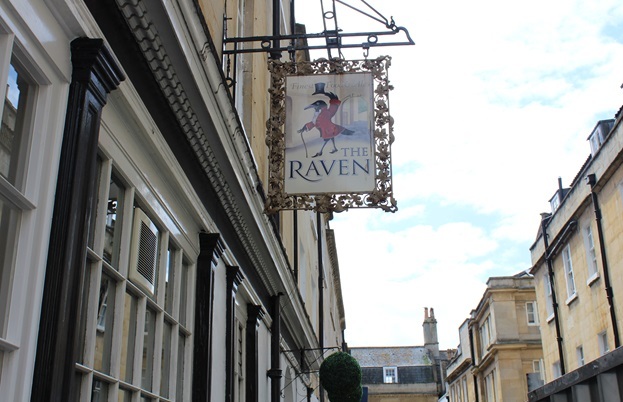 The Raven – tucked away on a cobbled street, this family-owned free house offers a refreshing selection of real ales, including the specially brewed ‘Raven’ and ‘Raven’s Gold’. The wine list is equally eclectic with relatively unknown grape varieties such as Viognier, Carmenere and English wines to boot. Hungry? Tuck into some traditional pub grub and steaming hot pies from Pieminister. Afternoon Tea – you can’t come to Bath without indulging in a classic of the Georgian era – afternoon tea. Be transported back to the more recent past at Bea’s Vintage Tea Room and take your tea in the splendour of fine china, embroidered linen tablecloths and 1940s memorabilia. The menu offers delectable cakes, speciality loose leaf teas and traditional breakfast and lunch favourites with a nostalgic wartime edge. Sally Lunn buns and Bath buns – whichever you prefer, both buns have their own unique place in the illustrious food heritage of Bath. Sally Lunn buns are large, round and made from an enriched dough similar to brioche, whereas the Bath bun is sweeter, being laced with sugar and currants. 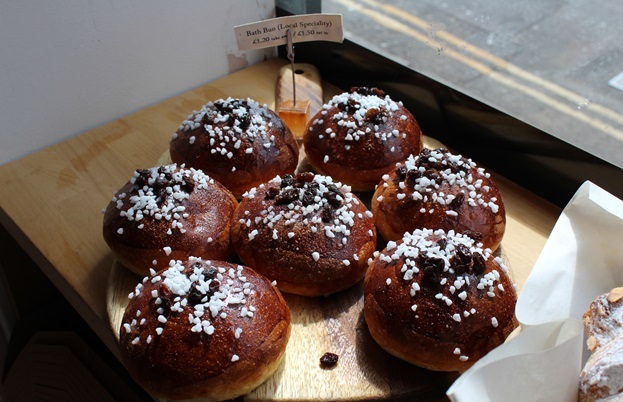 Both The Thoughtful Bread Company and The Bertinet Bakery have fine examples of the Bath bun. Bath Farmers’ Market – immerse yourself in the very best of Bath’s food and drink whilst supporting local producers every Saturday in the grandeur of Green Park Station. The ex-railway station is also the home to a variety of flourishing markets, cafés, restaurants and shops. Bath Christmas Market – join the masses of people who flock from far and wide at Christmas time to shop, eat and drink till they drop in the stunning surroundings of Bath Abbey. Peruse the twinkling Germanic chalets with a hot mulled wine or cider in hand and grab a tasty local treat or special one-off gift.